This was the outfit I wore to the launch event of The No Animal Brand at Jelmoli in Zurich. 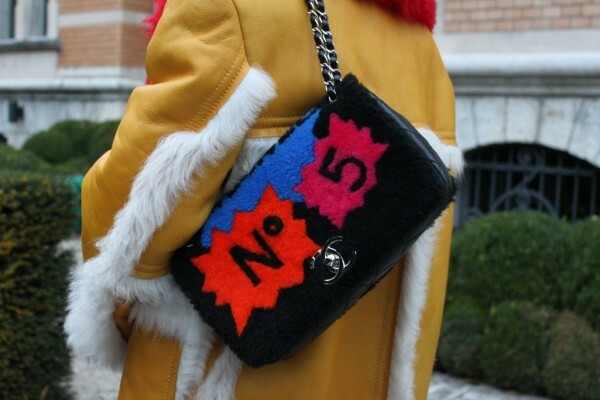 Shearling has been a huge trend this F/W 2014 season and Prada’s colorful designs are the best way to sport the fuzzy style. Oversized and extremely comfortable, Mrs Prada delivered sheepskin jackets in psychedelic seventies colours, that brighten up every grey winter day. My look: Shearling jacket by Prada, leather biker vest , lips print blouse with open back , red skinny stretch-leather pants and red ankle boots, all by Saint Laurent, shearling bag by Chanel, red lace bra by Victoria’s Secret, earrings by Dior and diamond ring by Vainard Fine Jewellery.